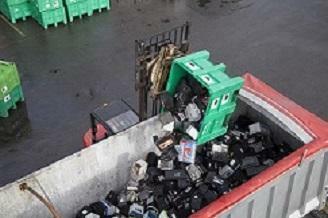 More than 98% of UK lead-acid batteries are recycled. Many are collected and handled in plastic pallet boxes of which the Dolav Ace has earned the accolade ‘The Battery Ace’ for being leak-proof and durable. G & P Batteries is the UK’s largest collector, sorter and despatcher of waste batteries of all types, especially lead-acid, portable and lithium batteries. Dave Brookes, Site Operations Manager at G & P Batteries, said, “G & P’s business is battery collection, sorting, storage and onward recycling. We collect batteries from CA [civic authority] waste sites, retail stores [e.g., Halfords, Sainsbury’s], and commercial and industrial sites. The G & P service uses the Dolavs as returnable transit packaging (RTP) on a constant cycle between client sites and G & P’s Darlaston handling facility. Each G & P Dolav box makes hundreds of cyclical trips. 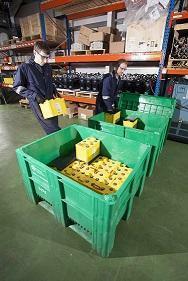 G & P customers value the RTP durability of leak-proof Dolav Ace plastic box pallets. We use Dolav plastic pallet bins because they are ‘UN Approved’ and leak proof. G & P and our sister companies in Europe have been using Dolavs for around ten years and found them to be very durable. The feet and the bin are one complete unit moulding, so the feet don’t become disconnected,” said Dave Brookes. G & P’s Dolav boxes are supplied with company identity, sequential numbering and UN Approval details hot die stamped on each box by Dolav before shipping.